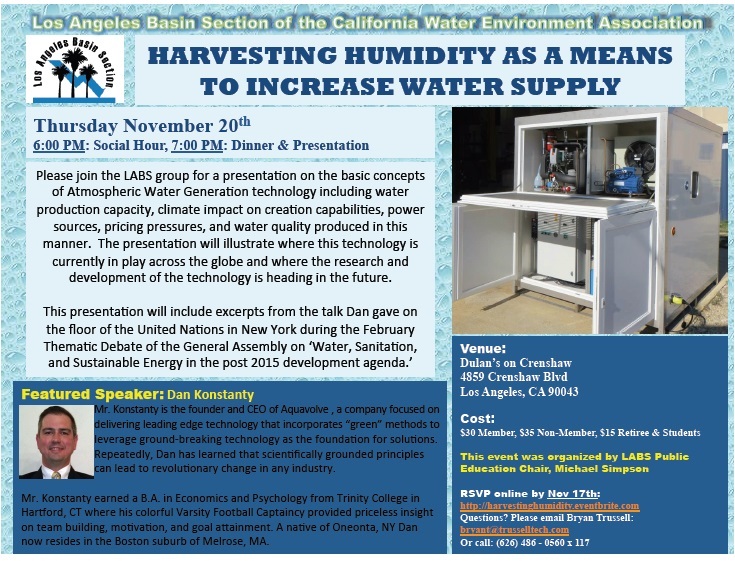 Aquavolve Founder & CEO, Dan Konstanty, has been invited to speak at the Los Angeles Basin Section of the California Water Environment Association in L.A. on November 20th, 2014. 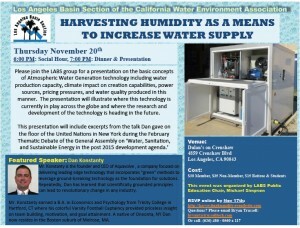 The presentation will be to explain the basic tenets of atmospheric water generating technology, the current state of development and deployment, key players in the global market such as Marc Parent of Eole Water in St. Tulle, France and Howard Ullman of AWS in Davie, Florida. This event was organized by LABS Public Education Chair, Michael Simpson. The Mayor of Los Angeles, Eric Garcetti, has been invited as an honored guest. Aquavolve is honored to present water making systems as an integral part of the solution to the water crisis in Southern California and anywhere water supply is in a critical shortage.